I steered clear of the treadmill during my early running career. They weren’t necessary—an apparatus reserved for yuppies and gym rats. I was a tough ultrarunner who ran outside no matter what; the worse the conditions the better. Years later, following a series of eye-opening events, my opinion softened and I discovered treadmills can be employed as a useful training tool. 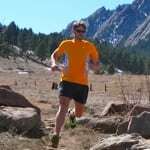 After a tough summer of running and racing in 2010, I developed incapacitating glute and hamstring pain that rendered me unable to run hard or far. Eager to solve the issues, I turned to a running-form specialist and then a treadmill to heal my wounded leg. In order to uncover the problems creating the hitch in my stride, Jeff filmed me running on his treadmill in two sessions spaced a year apart. 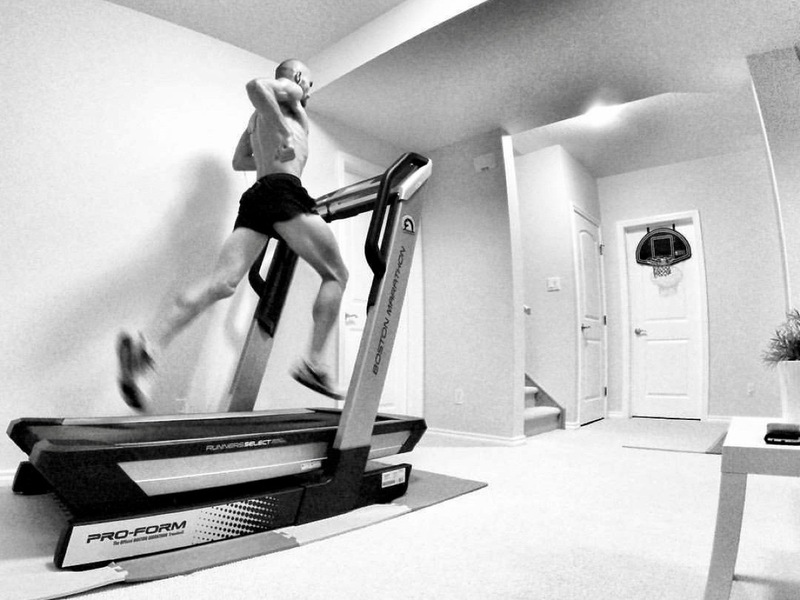 Have a look at my spring 2011 treadmill evaluation and here’s one from a year later in 2012. Jeff identified the easiest home remedy for fixing my form. I needed to increase my running cadence and land with my feet under my center of mass. Cadence improvement wasn’t easy for me. I had to get the hang of it. During the initial process of retraining my neuromuscular system, previously unused muscles got sore and I had to slow down and shorten my stride in order to increase my cadence. I found this difficult on uneven surfaces and hilly terrain. So, for several weeks, I almost exclusively used a treadmill to retrain and improve my cadence and form without the distractions of tripping, steep slopes, and/or navigating traffic. I saw drastic improvement, built confidence, and returned to the trails injury-free. It’s hard to maintain these form cues on rugged terrain when fatigue sets in. So, when I begin slacking, I return to the treadmill to remind myself what proper form and cadence should feel like. In the early 2000s, I met Coloradan Paul DeWitt (who now lives in Montana), head coach at DeWitt Coaching. His race resume includes wins at the Leadville Trail 100 Mile (twice), Vermont 100 Mile, San Juan Solstice 50 Mile, and Heartland 100 Mile. All impressive victories, but what still floors me most is his 2007 course record set at the low-key Pemberton Trail 50k in Fountain Hills, Arizona. During his second month back from injury, his shin still wasn’t healed, but he could tolerate uphill treadmill running. DeWitt incorporated 30-minute tempo runs at 7:30/mile pace and 75-minute marathon-effort workouts at 7:45/mile pace at an 8% incline. Easy and long runs were accomplished at slower paces and 4% grades. Over the ensuing weeks DeWitt was able to gradually decrease the slopes and increase his treadmill speeds—allowing his shin to progressively adjust to the new training loads. After training for less than three months on a treadmill for a trail ultra, Paul ran 3:11:55 for the 50k, a record that still stands 11 years later. When I learned that friend and fellow coach Jacob Puzey was lining up to break the 50-mile treadmill world record, I thought he’d finally gone off the deep end. In my opinion, and I’m sure many of you agree, spending five-plus hours on a treadmill at sub-6:00/mile pace seemed totally irrational. Puzey, who leads a team of coaches at Peak Run Performance, proved me wrong on December 1, 2016, at The Running Event trade show in Orlando, Florida, by setting a new world best of 4:57:45. Puzey’s world record underscores the notion that a treadmill can be effective for long and maximal efforts. In 2010, I began coaching a variety of runners from all over the globe. I determined quickly that the treadmill could be utilized as a comprehensive problem solver. Logistical Problem: Living in a place that has only flat terrain but racing in the mountains. Treadmill Solution: “We can’t all live in the mountains, but many runners enjoy hilly races,” says DeWitt. “Even if your races are pancake flat, you will still benefit from the strength you gain through hill training on a treadmill.” Many treadmill models offer 15% to 40% inclines, but lack a decline option. DeWitt suggests countering this by doing lower-body strength work immediately following a hard, uphill workout. We do not recommend raising the rear of the treadmill on boards or blocks to produce a downhill slope. Logistical Problem: Erratic pacing and failure to find a groove. Logistical Problem: Running too hard on easy days. Treadmill Solution: Keep your pace and effort honest on easy or recovery days by programming the treadmill to an appropriately relaxed speed. Logistical Problem: My day is too busy and I don’t have time to run. Treadmill Solution: “The treadmill can be a time saver, especially if one has children or an inconsistent work or travel schedule,” says Puzey. “I recommend the treadmill for those who aren’t able to train at the same time each day as a means of getting in the training whether at home or in a hotel or gym.” Squeeze in what you can on a treadmill when arriving late, leaving early, visiting unknown territory, or while the kiddos are napping. Treadmill Solution: As described above, use the machine to assist with gait retraining or utilize steep treadmill inclines for hiking or running when returning to fitness. If available, anti-gravity treadmills (e.g., AlterG), which lessen body weight and thus running impact, are also a good method for rehabilitation. Logistical Problem: The weather isn’t cooperating. Treadmill Solution: Rarely is race-day weather optimal. This is why DeWitt offers this advice, “I prefer to never skip a scheduled recovery run or long run due to bad weather. After all, you never know when you’ll be faced with adverse weather during a race. But when it comes to quality workouts, you want to be able to run hard and get the full value of the workout. That’s a good reason to use the treadmill.” Moreover, treadmill spaces can be modified to prepare an athlete for heat and/or humid race conditions when the outdoor environment is too tame. Logistical Problem: It’s unsafe outdoors. Treadmill Solution: If conditions outside are unsafe due to poor air quality, high heat indexes, lack of streetlights, snow, ice, or the like, fire up the treadmill to get your workout in. Logistical Problem: I’m unsure of my running capabilities. Torrence’s Easy Run: My favorite treadmill workout consists of an easy 60 minutes paired with an action-packed Netflix movie to prepare me for a hard workout the following day. Running easy on the treadmill keeps my heart rate low, effort easy, and allows me to focus on proper form and comfortable breathing. DeWitt’s Progression Run: “This is my all-time favorite workout to do on the treadmill because it is much harder to do accurately outside. It also incorporates a long warm-up which we often skip.” Start the treadmill at 15 seconds/mile slower than normal easy pace for the first five minutes. Then every two minutes speed up one ‘click’ (which equates to 0.1 miles/hour). Continue this progression until you’re unable to finish a full two-minute segment. Allow time for an easy cool down after your progression. Hill Version: Start at 0% incline, but keep the pace the same (normal easy pace). Instead of increasing speed, raise the incline by 1% every two minutes. Compared to the flat version, you’ll max out much quicker, so lower the grade back to 0% and start the progression all over again. Try two or three progressions. Again, finish with an easy, flat cool down. Puzey’s Speed Play: “If I’m training for a race that will require a bit more turnover or heat training—a road marathon or faster ultra—I’ll do intense efforts on the treadmill.” Warm up for 15 to 20 minutes. Do four to six 20-second strides to prime the legs. Then, run for 30 to 60 minutes incorporating random one- to five-minute surges at 5k to 10k race effort. Recover by jogging for the same amount of time as the repeat you just ran. Cool down by jogging for 15 to 20 minutes. If the goal race course is rolling, adjust the treadmill’s settings to incorporate random inclines. Set the treadmill at a 1% incline to counteract the lack of wind resistance created when running outdoors. Alter slope and speed throughout the workout. You can do this manually or some treadmills come with the ability to pre-program these variables. Unless you’re trying to achieve hot and humid, use a large box fan to mimic outdoor air movement and assist with evaporative cooling. Explore the use of non-motorized treadmills, like the Woodway Curve, in order to save money and energy and work harder. Tune in to a favorite podcast, crank your favorite music, or watch a movie. Consider going social with supported treadmill programs like Zwift and Peloton. Use a treadmill pace conversion table to determine equivalent efforts relative to pace and slope. Add ancillary training to your routine. By strengthening muscles used in lateral movements (which you don’t do on a treadmill), you’ll be less likely to wind up injured. Incorporate resisted monster walks, lunges in all planes, and side-lying leg lifts. Most people prefer to run outside. However, when the realities of life are weighing you down, the treadmill will, at the very least, keep you moving. Share your treadmill-running hacks! How do you keep it interesting and fresh with entertainment or workout variation? What role does treadmill running have in making sure you get your training in during bad weather, unsafe conditions, and complicated/full life logistics? Is there anything about outdoor running that you find can’t be properly replicated on a treadmill? Photo courtesy of Jacob Puzey. I love the treadmill because I love to read on it (using my iPad and the Kindle app). I read 26 books last year and almost all of that reading time was treadmill time. I also do find that it’s easier to get a run in on the treadmill on a busy day since I won’t have to worry about waiting for stoplights or driving to a certain location. Just get to the gym, change and go. As a woman, I also struggle with running alone in the winter when it’s dark so soon after work. I’ve had too many close calls with cars not seeing me and so sometimes the treadmill is a less stressful option. I understand the 1% incline to compensate for the lack of wind resistance. However, how do you compensate for the lack of cooling you would get from the same wind which keeps you from over heating on the run? I suggest using a large standing or box fan. I sweat a lot when I run and a fan placed directly in front of the treadmill helps. Some gyms may have this readily available, others may not. My treadmill is in the my non-climate controlled garage—in the winter it’s cold and in the summer it’s hot—but I use a fan in all seasons to create that air movement. It’s much less suffocating. Thanks! Last year I ran on the treadmill twice. This year, I ran outside less than 5 times between December 21st and today. The weather has been challenging (wind, ice and the polar vortex) but I have found that dark + cold is a very challenging combination. Since I run in the morning, I was skipping more and more runs. A light bulb turned on and I freed myself to embrace the ‘mill. At least I am getting my run on. And I will return to the outdoors once the sun begins to rise earlier because I have dogs that cannot run on the treadmill! There is a science-based treadmill conversion formula published in Minetti et al, “Energy cost of walking and running at extreme uphill and downhill slopes”, Journal of Applied Physiology, vol. 93, 2002, pp. 1039-1046 (https://www.physiology.org/doi/full/10.1152/japplphysiol.01177.2001). They studied energy cost of running and walking as a function of slope. They expressed results as a polynomial dependence which for small slopes (<15%) can be approximated with linear function, where 1% of incline is equivalent to ~6.25% of energy cost increase. That is, if you run 10 min/mile on 8% incline, your effort is 50% harder (equivalent to 6:40 min/mile "flat" running) and if you run the same pace on 15% incline, your effort doubles (equivalent to 5:00 min/mile "flat" running). I worked with Paul a couple of years. The TM workouts were some of my favorites. Introducing variety was key and the ability to work different “systems” was great. I still do these today with the incline progression being a favorite. You’re not alone. I deal with knee pain on a consistent basis and the tread mill brings out more pain for me than any other type of run (this includes road and trail). I can only hypothesize that since a treadmill is so flat/consistent, it demands better running form. Personally, I think road and trails may accommodate the flaws in my form due to their terrain variation- with trails being the most accommodating out of these three running types. This is all speculation so I would love for someone to chime in that may have a more technical explanation. Please, please, I beg you, absolutely DO NOT use that hillrunner conversion chart for elevation. The mere premise that each subsequent % you raise the treadmill will be LESS difficult is laughable. Here is the best calculator I have found though it still underestimates effort when you get in the higher elevations. An easy heart rate check will verify that. As a side note, running has been possible in other countries I would have thought it would not be, and I think fondly back to my sunrise runs in congo. Hi Ian, great article! I have been mixing in treadmill walks at 15% incline and speeds up to 4.0 into my training lately to gain an easy way to add hill training into my otherwise often flat desert running. I started around 10:00 and have worked up to 30:00, which is surprisely quite tough. I’ll usually start at slower speeds for a bit and then fast walk at 4.0, all at 15%. So, when DeWitt recalls walking workouts of 90 minutes at inclinces 8-12%, I now see how challenging those must have been. One thing, I did try running at 15%, 4.0 for awhile but I ended up with a very sore lower back in the morning. I’m in my 40s, so it might be partly age but I’m thinking I probably worked it too much too soon at that incline. Finally, awesome title, who doen’t love Floyd?! I had to laugh at the suggestion that a Woodway treadmill is a way to ‘save money’. And I laughed at your comment Michael, because you’re correct. They aren’t cheap! I was thinking of their “green” capacity. I had a single track mind and was only considering what they’d save on the electric bill. Thanks for reading and commenting! It goes without saying, but treadmills are great when you need to be close to home/work/gym etc. Ie. if you’re expecting a phone call, kids are playing outside and/or napping, on call at work, uncertain time commitments etc. or even if injured or unsure how long you want to run for. Just step off when you have to and go about your day. So physically proximity to the starting point is a major advantage over running around outside (although I do prefer the latter). This is a great article. I have always been a huge advocate for treadmill training and I know one consistent sub 2:30 marathoner who trains all winter, including regular 20-mile workouts. I would add a caveat. Not all of us can afford a treadmill, or even a gym membership. As an alumnus I can only afford drop-ins to my university gym the few times a month I use a treadmill (I work for a non-profit). If your city has community centers these may be an option. My favourite workout is speed + hills. I run a fast two miles at increasingly fast pace beginning with a tiny 2% incline (ending in a 5:30 half mile at 0% incline). Then I hit the highest possible incline and run as fast as I can for two minutes. I lower the incline 3% and increase the speed. I do this until I am running 8 miles an hour at whatever the incline I’m at that I can tolerate (and I have done this for at least 12 minutes), then one minute active recover and hydration, and then a progressively fast mile. I do the same hill workout again and one more fast mile. Then one slower recovery mile at 2% grade. This is a sick workout and it can easily be scaled for relative fitness. It kills an hour quite nicely.